As a boy, I looked out of a hotel window in Albuquerque, New Mexico. I saw women in colored skirts and snow-covered mountains. 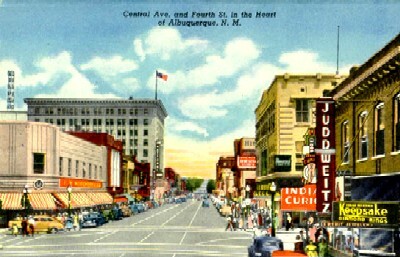 In 1947, my mother and I and her boyfriend traveled to Albuquerque, New Mexico, from Brownwood, Texas. I do not remember the name of mother’s friend, but he was a nice man and very kind to her. I was five-years old. The road we traveled to New Mexico included a long stretch of highway paved like a washboard. I sat in the backseat, and for an hour or so when we hit that stretch of highway, I bounced up and down. At the end of the bouncing lay Albuquerque, a city that imprinted the New Mexico I revere in memory. My mother and father divorced shortly after World War II, and mother worked at several jobs to support herself and me. We lived with her mother, Effie, who worked also at odd jobs to pay the groceries and rent for trailer house space under walnut trees on Fourth Street. It was a very small trailer with one room composing three bunk beds and kitchenette. Our toilet was in the neighbor’s house from whom we rented the space for the trailer. Late into the evening, the Philco Safari shortwave radio emitted a golden glow with its sounds of music, news and comedy. 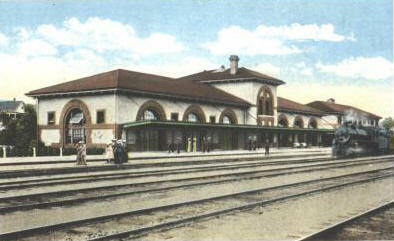 Mother must have met her boyfriend at the cafe she worked, across from the Harvey House at the Brownwood Santa Fe railway depot. He toiled for Santa Fe railroad. She also waitressed (it became a verb in our family) downtown at the Cactus Cafe where she became cashier before being hired by Southwestern States Telephone Company, a corporation she worked at for over thirty years. Mother had blond hair and blue eyes, about five feet, two inches tall in height. She was slightly built and vivacious — Irish through and through. She was quite verbal, having descended from a background of story tellers and fiddlers near Bend, Texas, a small village along the Colorado River in central Texas. Stern and hard-working, she pushed herself to the extreme while young and it did not cease when she grew old. This trip, however, was a vacation to Albuquerque with a close friend and there was no work involved, just fun and merriment. We must have stayed several days in Albuquerque. Mother and I stayed in one hotel room and her friend stayed in another. She bought me a book, Indians of Yesterday, that I still have to this day. We visited the Old Town trading area and shopped downtown. Our hotel was several stories high, but I don’t remember the name of it. The view from our hotel window looked down upon the main street and in the distance, the Sandia Mountains. I remember gazing out that window. I would have solitude in the hotel room. Not long, just enough. 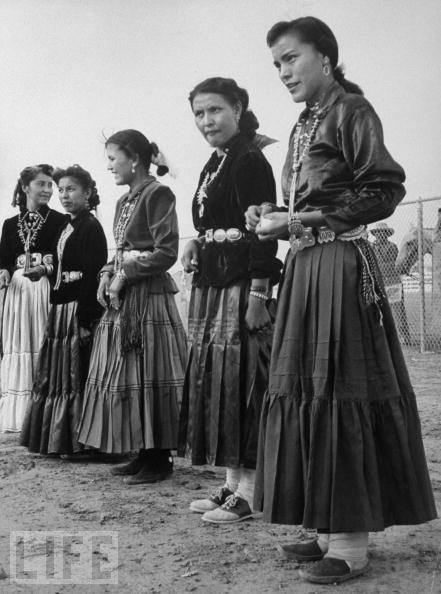 From my window, I looked down on the street corner and saw women dressed in colorful skirts with concho belts. Their hair was black and they clustered in drops of color about the shops, standing, milling around. Within the skirt pattern, some of which were black or navy blue, I could see rhythmic lines of white ribbon. Soft boots, it seemed, they wore. I don’t remember their wearing hats or bonnets. Exotic women, full of energy, covered in color. It seemed as if they wore several skirts, layered one upon the other. I peered up from the hotel room and saw snow-covered mountains in the distance, deep purple, deep blue, holding secrets. I looked at them and wanted to go to the snowline and touch the cold — or, have the cold touch me. I looked down at the women and looked up at the mountains, then the scene as a whole, one tableau. As a child, I comprehended novelty, but I was also enamored by the scene from my window. 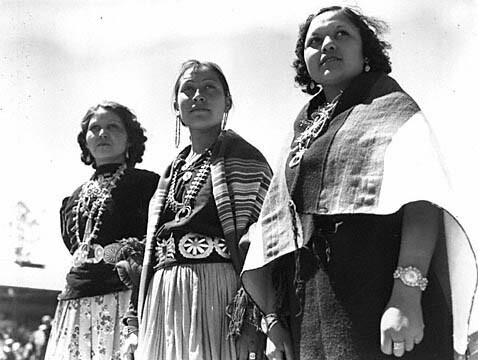 Today I know that the women are the Navajo that come for trade and fun. The mountains are the Sandia, the location of the earliest paleolithic finds in North America, and I have taken students on field trips to see the Sandia Cave. These new attributions of New Mexico embellish my early memory; they neither replace nor smother what I saw as a child. You could say, I suppose, if mother and her boyfriend had taken me to New York City, I would have become entranced with cities, but I doubt it. As it was, we returned to Brownwood, Texas, and I got bounced again on the highway while mother and her friend chatted and laughed. Mother continued for a time to work at the cafe across from the Harvey House. Time passed before I returned. In 1955, I traveled to Glorieta, New Mexico, with a church group. I was distracted by infatuation and pious supervisors, but I remember the smell of conifers and the soft carpet of pine needles about the camp. There were neither colorful skirts nor snow-covered mountains — a regretful trip, in so many ways. Then, in 1967, my wife and I traveled from Amarillo, Texas, to Raton, New Mexico. We had spontaneously decided to go at four o’clock that afternoon. So after packing quickly, we got in the Ford Mustang and drove through thunderstorms to New Mexico. As lightening flashed, it illuminated the countryside and I remember the volcanic hills and mountains flaring to light, then darkness all around. We reached Raton at midnight, excited by our thunderous passage westward. For the next three days, we stayed in Raton, Taos and Santa Fe. I was twenty-five years old, twenty years since I had been in Albuquerque with mother. To me at the time, and even now as I compose this piece, the early visit to Albuquerque and the jaunt to Raton seemed a hundred years apart — long, long in-between, though only twenty years. I cannot account for the emotional relativity of it, but it is true. The effect of the quick trip with my wife to New Mexico, however, was quite different from the regret of Glorieta. I dreamed in vivid colors of New Mexico when I returned to Amarillo: passageways of art and pottery, cafes of chile, museums, people dressed in color and turquoise, adobe walls and hornos. I made plans for a second visit to go farther into the forest and into the desert and trade shops. Over the years, I slept in maid’s quarters and the backseat of my car. I was stranded alone, overnight, in a snowstorm on top of Jemez Pass, bundling in a bedroll and losing a bit of an ear by frostbite. I went again and again and I am still going. I have stayed long enough in the high desert and mountains, however, to become acquainted with rough and jaded junk that falls into arroyos, the brutality of domestic violence, the rage induced by alcohol and drugs on the streets and hyped-up-commercialism of some Native American craft. I was never an innocent about New Mexico. Never. It is the land and the people that draws me: the rhythm of the drum, the conifers of Carson, the silky dust of an unpaved road, the remembrance of man and horse plowing the field at Mora, bronzes of Canyon Road, the Dona Luzes of La Casa Sena, Truchas, sagebrush, meadow and the vista of Logan. After my divorce, I took my daughter annually to New Mexico, camping out and staying in fine hotels. We saw Christmas lights on the highway from Tucumcari to Las Vegas, arriving late in Taos one evening. In the summer, dust devils rode beside us, rocking our pickup as we cowboyed through the devil to the campground in the cool forest. These days, my wife and I journey to those same places. In overcoming loneliness and discontent, I was lucky to have been seized by terrain, something massive and material rather than soft and ideological. It is not all pleasant, this nature writing, because one season is green, the other brown and dying. Yet, the sage blooms again and the rios grandes have always run shallow or deep, never dry. I see it as my duty to attend these cycles and write about them so that a not-so-bloodless redemption may save our planet yet. It may be a futile effort and I may be wrong. Indians Of Yesterday, by Marion E. Gridley, illustrated by Lone Wolf, M. A. Donahue & Company, 1940. The Dona Luz was a restaurant in Taos. I use it here as a personal application to La Casa Sena restaurant, reflecting all the cuisines of the region. To my knowledge, there is no Dona Luz at La Casa Sena. The Dona Luz in Taos had a wine cellar that was dug deeply into the ground. I always liked to eat at a table near the stairwell to the cellar so that I could look down at the wine racks. I have struggled to define the attraction I have for the Southwest, New Mexico in particular. Texas has its fine qualities and I’ve spent most of my life here and I type it, of course, as southwestern, too. Being a child and on my first, conscious, exotic vacation, the Albuquerque visit would be striking, a first-time event of major proportion. That is explainable by that context. The visit to Raton, Taos and Santa Fe in 1967, is inexplicable. Calling it a “rebirth” makes me want to stick my finger down my throat. The closest classic description of what happened is D. H. Lawrence’s statement that New Mexico and the high desert vistas called him to fully attend the physical environment (I paraphrase). That’s about as close as I can define it: made me attend like never before. nice essay, jack. i enjoyed it very much. Thanks, Ken. You are my director, after all. Great New Mexico descriptions! I love that area and it does draw one in, but I know there are things there that I will never see in my lifetime. There’s too much. The area is so historical and almost mysterious — a “land of enchantment,” indeed. Thank you. Yes, Elaine. I have a list and I’ll never see it all in my lifetime, either. For some the things on my list, I have to be invited — to visit Blue Lake above the pueblo, for instance. Beautiful. I felt like I was there with you, seeing through your five year old eyes. Thanks, Martie. You are one of a kind. Hope your stay is going well on the coast. You have described the towns in New Mexico so well. I pictured them as you wrote, because I have photographed the various locations. Your words do justice to New Mexico but one needs to come visit in order feel the beauty, culture, history, and people that you have brought to light. With your words and my pictures of New Mexico we can share with others the Land Of Enchantment. Thank you for complimenting my descriptions of New Mexico. Your photographs are truly jewels reflecting New Mexico. Yes, you and I can share with others what that country means to us. You have to photograph, as I have to try and explain it. Hope your talk goes well at Rio Rancho. And, a nice play on words in your title. Thanks. I had fun with that one. Catchy titles: I’ve not thought much about them until I started blogging. Thanks, Teresa. I try to pull the three tenses together. Glad you noticed. One of my favorite posts since I have been reading your blog is this one. Growing up in New Mexico, I understand this attraction you have for that land, its spirit, and memories. Wildstorm: Thank you. I did not know you grew up in New Mexico. Fortunate, I think. Yes, an attraction. I’m am there now, having spent four nights up in the field, but now down in Santa Fe washing up and eating better. Fully-rendered, honoring the subject with a light touch, Jack. So nice to hear the tales. A northern New Mexico saying is ‘Entre verde y seco’ — ‘between green and dry’ — shared early on in writings of sociologist Tomás Atencio and writer Lesley Poling Kempes later. Your own comparing of the contrast of the land with the contrast of lives lived upon it is an echo of this saying, which I believe refers to the edge of relief that exists between it all. Cirrelda: You bring so many fine books to my attention and sayings. I like the between green and dry. I must pick these authors up. Thank you for your comments. I appreciate your attention to my prose…makes me want to make it better.